Have a passion for acting or drama? Here’s an opportunity to hone your skills in drama. National School of Drama (NSD) has released its admission form for its three-year diploma course in dramatic arts. The last date to apply is April 15, 2019. It is a full time residential course which will start from August 5, 2019 to train the students to become professionals in the area of acting, design, direction and other theatre related disciplines. There are a total of 26 seats. All selected students will be given a monthly scholarship of Rs. 8000 per month to meet their academic and related expenses. Candidates can get the study material and guidelines for the PT/audition on the official website of NSD. Click on “REGISTER YOURSELF” . After filling the information required and click on “SUBMIT” . You will get your User ID and password in your registered email ID. Login with the given ID password. Upload your photograph and signature in the required file size. Then, Pay online the application fee. “To receive the application form and prospectus (in English & Hindi) by post, please write to The Dean, Academic, National School of Drama, Bahawalpur House, Bhagwandas Road, New Delhi – 110001 along with a crossed Demand Draft/Pay Order, payable at Delhi, of Rs. 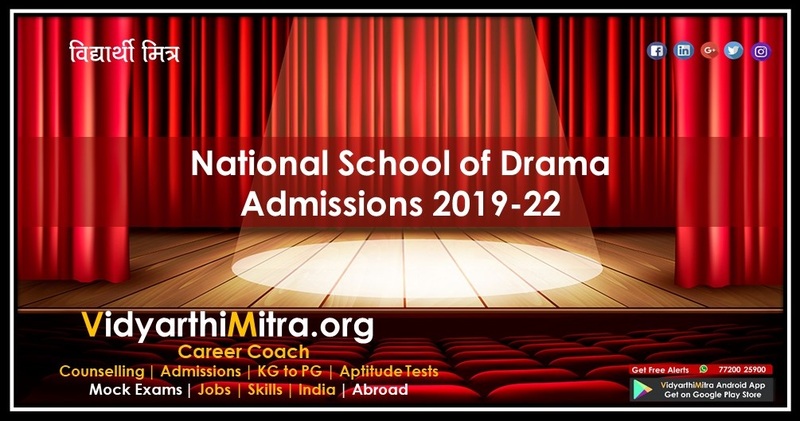 225/- (Rupees two hundred twenty five only) including postal charges in favour of The Director, National School of Drama, New Delhi. Request for receiving the application form by post must reach the school by 28/03/2019 Offline application forms duly filled in & complete in all respects must reach To Dean Academic, National School of Drama, Bahawalpur House, Bhagwandas Road, New Delhi – 110001 on or before 15/04/2019. No application form will be entertained after the last date in any circumstances. All the foreign nationals have to apply through Indian Council for Cultural Relation as per the norms, ” the NSD admission notice reads.